Get your laundry super clean and super soft with the power of goat milk! 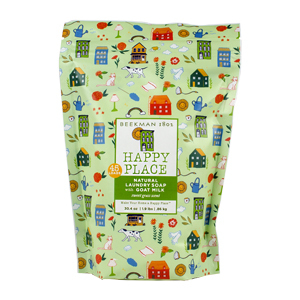 Happy Place Goat Milk Laundry soap is concentrated so you only need one tablespoon per load and was formulated without harsh chemicals to clean and freshen even your dirtiest clothes, naturally. INGREDIENTS:Goat Milk Soap, Soda Ash, Sodium Bicarbonate, Borax, Metasilicate, Blend of Essential Oils. Made in the USA. Happy Place products are lightly scented with Beekman 1802 Sweet Grass. This scent was chosen for its light clean fragrance. Mary Lake-Thompson Collection - Soap Bar - Black Sheep and Mary Lake-Thompson Collection - Sachet - Winter Sheep are both similar accessories: soaps and handcreams.